If Enterprise Voice is the most efficient way to achieve savings while increase productivity, Exchange Unified Messaging is the most beautiful part in the entire Unified Communications concept. Georgia Military College currently employs Exchange 2007 as enterprise email solution. It have been said enough already of the advantages of the Exchange server – no need to repeat it here. There is, however, a role called Unified Messaging, which contributed a great deal to our Enterprise Voice solution. Remember the $3.00 per Voice Mail box with our former provider? Multiply this by the number of phone lines/users and a here where a good chunk of MRC goes in some cases. With Exchange Unified messaging, a voice mail is no longer the simple registration if the fact someone called, said something and left a call back number. Now we have a visual representation of the call arriving via email. We can play it on our computer, listen it over a phone and once we upgrade to Exchange 2010, read it. That’s right; Exchange will email us a transcript of the voice mail. How about that! Now, I don’t know about you, but I enjoy every bit of the ultimate visualization of the event. I can click to play the message on my PC speakers, to reply with email, or click to start IM session or… click to initiate a phone call. The common denominator here: “click”. No time wasted. EDU folks knows already how important is the communication between faculty and students in meaning of reachability. In typical scenario, the kid would know the name of the Faculties but not their direct numbers. They would call any number associated with GMC (typically the last number from which someone from GMC called) and the run around begins… frustrating for both sides. We Provisioned Auto Attendant to be a single point of reach for all faculty – one number is distributed in the beginning of the quarter to all students. The AA is “narrowed” to a list with Faculties only, and the caller can simply speak the name and be connected. A parent would call the school secretary and leave a message for a teacher, who in return would check several times throughout the day “Is there something for me?” and then handle it. Another, although insignificant for someone part, would be the missing indirect interaction with the caller, meaning of intonation and sometime anger etc. In our case, we decided to provision out K12 teachers with mailbox without actually participating actively in the call flow i.e. a phone or DID assignment. Now the school secretary forwards those calls immediately to the teacher’s voicemail, which in turn is delivered via email immediately to the user. The possibilities are endless and UM role could handle wide variety of scenarios – it require good knowledge of the capabilities (and limitations) of it and patience. Patience to listen what your users need, not what “you think they need”. Ah, the touchy subject… Let me tell you what I think. Microsoft have the leverage to learn from the best when comes to VoIP. OCS EV proves every day to be a valuable alternative to the Big Boys (and big money) solutions. I know at least one place where Nortel slashed their yearly maintenance fees 60% in desperate attempt to “distract” the College from moving to Microsoft UM and… yet this same college uses Exchange as email solution, OCS as IM solution, SharePoint as collaboration solution and so on. What would be the logical choice for VoIP in this case? Back in the days, when I told my boss that we need to place a $500 phone on the desk of an entry clerk that makes less than a $20,000 per year, he sent me to take a drug test and began listen only when I introduced endpoint for less than $80. Besides, Snom 300 series looks like a phone, feels like a phone and works like a phone. All our executives have Tanjay not because it looks cool but because it introduces features unseen before. It is simply the ultimate collaboration tool one could have on its desk. Let say the CFO calls branch office Director to discuss a budget request from the Dean. At some point the Director will say – “You know, I see the Dean is available, let’s escalate this call to a conference…” and all this from a phone device. Beautiful! Next to come is the connection of your internal OCS environment to the world. Actually, if you have an existing hosted PBX (analog or digital incl. VoIP), by carefully planning the migration steps, you can move your users to Microsoft UC platform working your way from department to building to campus to DLC. 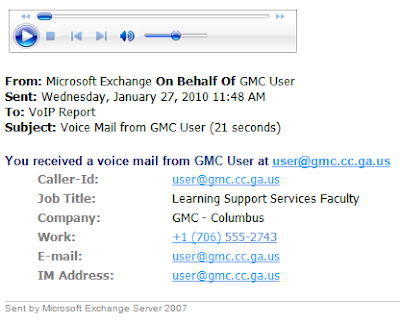 As I mentioned before, GMC had PBX (sort of), hosted on our provider premise. You might find interesting the fact that due to the stubbornness of our provider, (refused to release the phone numbers for porting), we changed ALL phone numbers throughout the State of Georgia. You see, reducing the MRC up to 80% could be a very effective argument of otherwise No-No in the EDU sector. Here I need to say something – I considered Microsoft certified partner first (no names) and even ran quick interop test which worked beautifully. One problem though – even they offered “local” DID’s i.e. Milledgeville numbering scheme, the billing Local Calling Area was Atlanta and so, when someone from Milledgeville calls (478) 387-xxxx (local number), the caller would be billed LONG DISTANCE charges because the termination of the trunk is actually Atlanta. Bad idea! The local phone companies fall from the band wagon right away - $1,300 for a single T1 PRI (23 voice channels) or $56.52. What were they thinking!!! Back to Broadvox… a concurrent call (single trunk) cost ~ $13 - $15 (depends of the type of the contract), and so our Milledgeville campus trunk (40 concurrent calls) cost us now… a little over $500. Can’t beat this. Basically, we accept SIP and RTP traffic from set of IP addresses (a distributed failover) and send traffic to FQDN (load balancer). Of course, one might say “SIP trunk is a single point of failure” and this is correct. However, we presented the Pros and Cons of every option to the Boss and the ultimate decision was to achieve maximum savings while recognize the risks.